I’m not really looking forward to writing this one. In general, I like to be positive about the games I talk about or at least constructively critical. SWTOR is almost four years old now, and I can’t imagine my critique at this point is able to be constructive. Still, it’s something that weighs on my mind, especially as someone who does their own writing, and perhaps I can put the thoughts to rest by writing them down. As per usual, spoilers ahead, probably more significant than the others of these I’ve written. I’ve been doing these in pairs for a particular reason. 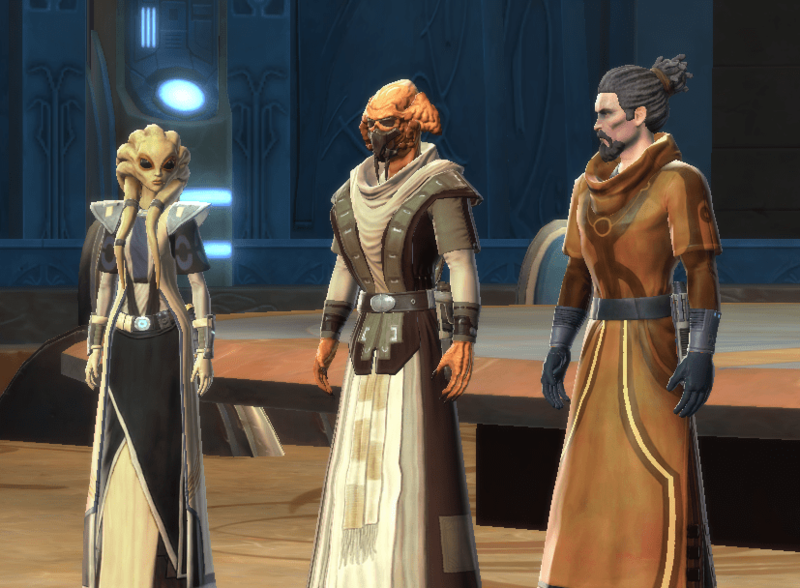 SWTOR class stories tie together in thematic pairs surprisingly nicely. Whether this is an intentional sort of duality or not I don’t know, but as I’ve played them, the classes seem to arrange themselves into tidy pairs. Trooper and Agent are stories about being a dutiful member of an organization. The Sith Inquisitor and Warrior stories are about paths to power and respect. The Smuggler and Bounty Hunter stories are about being on the outside looking in (and I’m interested in seeing more of both). Finally, the Jedi Consular and Knight stories are about being superheroes, the key piece that sets Star Wars apart from other settings. I talked before about “Star Wars stories” vs “stories that happen to be set in Star Wars”. Both of the Jedi stories are the former. In general, I’m a lot less of a fan of these stories, and in the case of the two Jedi classes, one works and one doesn’t. I’ll start with the one that does, so I can talk about the other one. 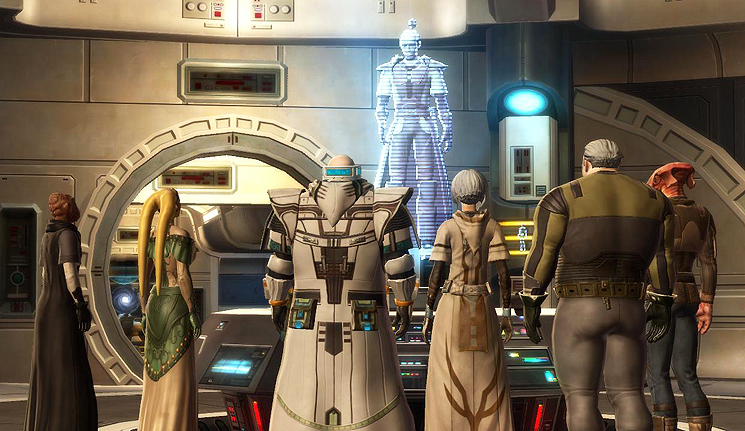 The Jedi Knight storyline is, in a variety of ways, the “main story” of SWTOR, as much as it has one. It draws from the great moments of KOTOR, the prequels, and the original trilogy to deliver a focused beam of cool Star Wars-y content. It has companions that pull from the “standard” characters throughout Star Wars and the events that occur during the Jedi Knight story are not only referenced in other class stories more than pretty much any other class, but in fact are the catalyst for (at least) an entire expansion’s worth of content, as well as frequent callouts elsewhere. The story is comprised of pretty much every Jedi-y concept in Star Wars, and it’s very clearly thoroughly thought out. The first Act of the story is about finding and disarming superweapons. You’re plunged pretty much instantly into Serious Business, and the game slowly weans you off your older, snarky master. Of note here: your master is basically Qui-Gon Jinn, and throughout the first act you are Obi-Wan Kenobi circa the Clone Wars, complete with your very own not-entirely-light-side Padawan, who hides a secret from you. You get to be better than Kenobi, though, and while your master is killed, he comes back as a spirit and advises you from beyond the grave, and you can keep your Padawan on the straight-and-narrow, with a bit of leeway and understanding. Throughout Act 1, there’s this continual choice to kill your foes or to try to redeem them. Almost all of these characters are set up very well to make these choices not so cut and dry. There’s a lot of doubt surrounding the ability for fallen Jedi or Sith to be redeemed, and you also deal with the political fallout of “traitor Jedi” which tarnish the Jedi reputation. The choices were compelling enough (and my lack of care about being “full light side” or “full dark side” being pretty significant) that I actually spared some and killed others, based on the situation. Acts 2 and 3 are where things really pick up. While other classes are embroiled in internal rivalries or military actions or what have you, as a Jedi Knight you are gunning for the Emperor himself. It’s a bold move, and Act 2 is about setting your strike up, bringing together some other dedicated Jedi, and attacking the Emperor’s secret base. It’s a very KOTOR-like segment, with you working towards a clear, obvious project. I like the delivery here because what you’re doing is notable every step of the way, and you’re reminded what you’re doing and why, so there’s none of the usual “why am I on this planet again?” sense of disorientation. The characters you meet along the way are generally interesting as well (I especially like the Jedi Master who has several “meedee” droid pets). 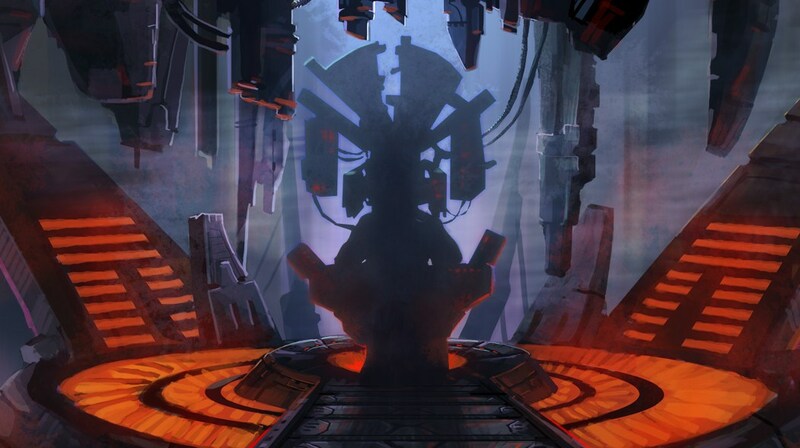 Act 3 begins after your (failed) attack on the Emperor, during which you gain a lot of insight into the Emperor’s (horrific, galaxy-destroying) plans as well as gaining an unexpected Sith ally. Lord Scourge is an interesting character, and contextualizes for the Republic what the Sith opinion of the Emperor is. He wants to see the Emperor go down just as much as you do, but has no faith in the Dark Council’s ability to fight him. He’s had a vision and made a deal with the devil to be able to see it through. In Act 3, you get an interesting inversion of the redeem/kill choices in Act 1, as you find yourself face to face with the rest of your Jedi strike team, all controlled by the Emperor. Throughout Act 3, you are Luke Skywalker, hero of the Rebellion Republic, and helping out with military actions while setting up to take down the ultimate evil in the galaxy. The final confrontation with the Emperor is distinctly reminescent of the end of Return of the Jedi, with you going (mostly) alone deep into enemy territory, and the story’s finale looks more like the awards ceremony at the end of A New Hope than anything else in the game. The music is exciting, the applause raucous, the lights gleaming, and the camera hitting the right notes. 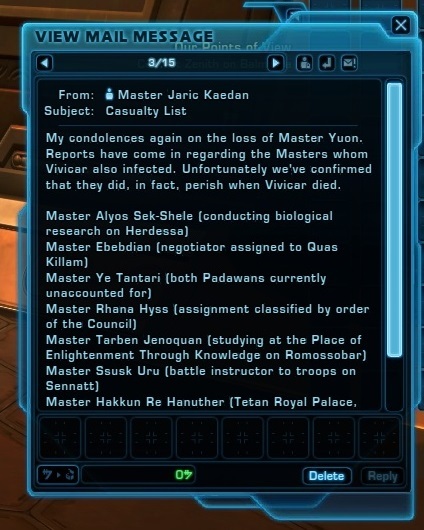 For all that the Jedi Knight story does well, the Jedi Consular stumbles and falls. I’ve played through this story twice now, and the Consular is mechanically my favorite class in the game, but I am extremely glad I played it first, before playing any other class story. I don’t want to go on and on about how it’s just a bad story, but I do want to talk about why. For the Sith Warrior, Sith Inquisitor, and Jedi Knight, there are clear, obvious characters in the Star Wars mythos that are being evoked. For the Consular, not so much. There aren’t a lot of Consular-type Jedi who take front-and-center; you’ve got… Yoda, and… Yoda. Talking backwards at people is not exactly compelling gameplay and a core conceit of Yoda’s character is that he’s crazy powerful. Being crazy powerful right at the start of the Consular story doesn’t work, and it’s pretty clear from the word go that the story is kind of adrift. 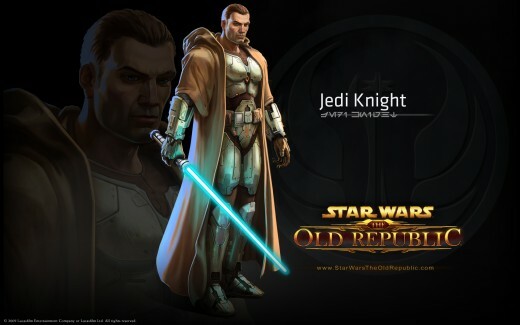 Notably, playing Consular and Knight side by side, it feels like the Jedi Knight was a story built on the big, notable “Jedi” moments and the Consular was kinda left with the scraps. Throughout the Consular story, there are these hints at cool “Jedi” moments, but they’re never delivered as well as they are in the Jedi Knight story, or as coherently. There’s a ton of mysticism, which is appropriate, but it ultimately doesn’t affect much– the mysticism quickly becomes a hand-wavey way of telling me that I’m doing “something cool” without showing me why it’s cool. As an example: Act 1 is about… a virus, kind of, that sort of affects Jedi Masters. Your Master falls ill and one of your first acts is trying to cure her. You’re looking for some Jedi artifacts that are unique and special and put you face-to-face with some old wise Jedi Masters, some of which are callbacks to KOTOR and all of which are lore faucets, telling you a bunch of things that boil down to “we have no idea what’s wrong with your Master”, up until you find the very last one. There’s no sense of progression other than a few throwaway lines along the lines of “oh, yeah, we can think about this more clearly because you found the other ones for some reason”. Bear in mind: during this same stretch of time, the Trooper is hunting the squad that betrayed them up close and personally, the Smuggler is seeking revenge for their stolen ship, and the Jedi Knight is racing to stop a superweapon. 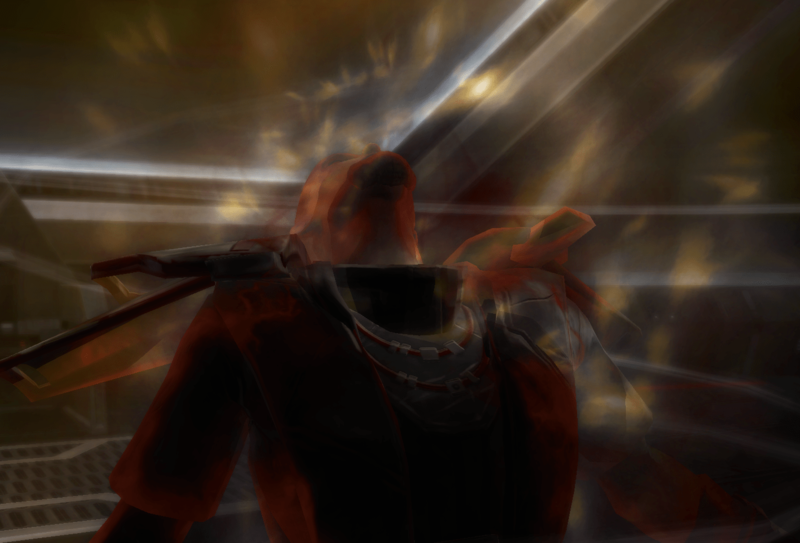 The Consular is… looking for some forgotten lore to help fight some mysterious ailment that’s affecting their Master? Eventually you find this cure, some kind of ritual that blocks the virus and the mind control (?) that comes with it. You’re warned that doing so weakens you in some unspecified way, but that’s about it. This is the big story hook that’s supposed to draw you into the rest of the story, and it’s vague and uncertain. It’s also littered with holes that make it feel even more uncertain and not super well-thought-out. One of the first things you find out in this whole hunting-the-cure segment is that your Master is mostly delirious or comatose and attacked one of the medical staff. A little later, this happens again, and you have to fight her yourself. She’s equipped with her lightsaber. There isn’t even an option to ask the medical staff why they let a delirious, violent, martially-trained patient keep their deadly weapon. The story is full of these “wait, what” moments that further weaken the already uncertain story. These kinds of things exist elsewhere, and it’s possible to accuse me of nitpicking here, but the point I want to make is that a minor plot hole like this in a strong story like the Agent’s is a lot less noticeable and more easily forgiven than a similar issue in a weaker, less compelling story like the Consular’s. Act 1 continues with you finding out that some Masters might also be afflicted, so you travel around the galaxy checking on them and finding out that, yep, they’re all afflicted. You track them down, find out they’re preparing to do something awful while mind controlled, stop them from doing said awful thing, and then decide whether to save them or not. There’s a parallel here to the Jedi Knight story, except that in the Jedi Knight story the people you’re “saving” aren’t necessarily innocents, whereas every single one in the Consular story is an innocent who is literally being mind controlled. Your choice is to save them, like you came to these planets to do, or murder them with no real rationale. There’s the occasional person on the planet who clearly doesn’t understand the big picture who tends to urge you to kill whoever you’re there to save, but you don’t really get the opportunity to explain things. Act 1 wraps up with you working some mysticism with your Master to find the location of the person behind all of this. You get pretty much no clues about where to find the guy or who he is up until this point, and then you perform some unspecified ritual and then hunt him down. When you get there, surprise, it’s some guy you’ve never met but has been hinted at throughout Act 1, except everyone thought he was dead, because that provably stops the Force elsewhere in lore. During the showdown, he mocks you, saying that you can’t kill him because he’s infected TONS of Jedi Masters somehow, despite the disease spreading by touch, and if you kill him all of those Jedi Masters will die. The frustrating thing for me is that I’m trying to be charitable. I’ve played through this story twice and it’s still vague and uncertain for me, and almost every major plot point in Act 1 boils down to “because magic”. The first Act is not without its bright spots, too. There’s a really cool moment where you can save some people from a burning wreck using Force Lift, because you’re just that awesome, and it’s a moment of greatness unlike anything the Jedi Knight gets to do. Later, you get to take part in a diplomatic summit, which is another neat moment and wraps up that planet very nicely as well as foreshadowing the next Act. 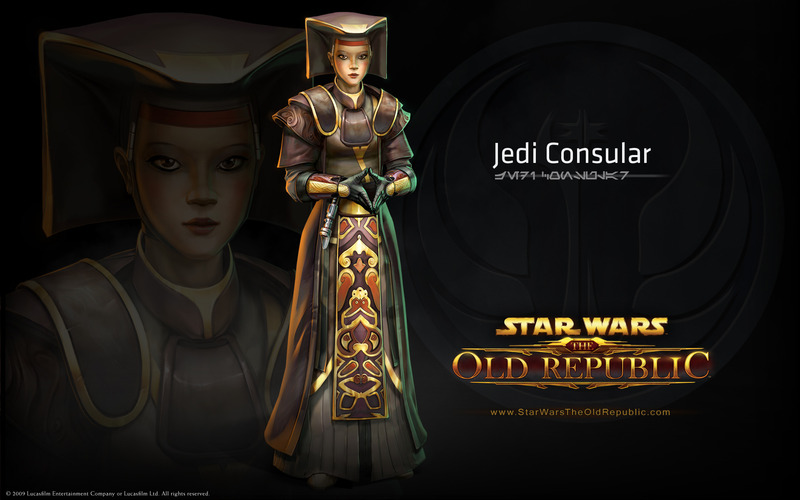 The Jedi Consular is at its best when it’s getting to do things the Jedi Knight doesn’t get to do, and at its worst when it’s doing the same things as the Knight but less interestingly. Act 2 shifts gears considerably, and is, I think, the most interesting part of the Consular storyline while being the most frustrating. Your role shifts to diplomat, and Act 2 becomes about getting a particular group of people to join the Republic by, essentially, solving their problems on their home planets. This would actually have been really compelling if any of the representatives you dealt with were likable; they’re pretty much all either sniveling or entitled, and doing work for them leaves you feeling unappreciated– you get a lot of grudging thanks and bickering that mars an otherwise compelling story arc. Act 3 returns you to mysticism land, where once again you’re dealing with mind controlled people, mostly Force-users, who are the Children of the Emperor, secretly doing his bidding as sleeper agents all over the galaxy. This is a really compelling concept that unfortunately just becomes mystical nonsense because it doesn’t have enough build time. You sort of get a few infodumps about who these people are and why they’re bad and then you do some magic to find them and stop them before they complete their inevitable betrayal. This culminates in you facing off against a notable Jedi Master who’s one of the few recurring characters in this story, which is an honestly really great moment. It’s overshadowed by the Jedi Knight getting a nearly identical fight at the exact same time with a better-developed character, right BEFORE a much more impressive, much more epic sequence that the Consular lacks entirely. The storyline can, in theory, be held together by its characters, though. The Smuggler story, from what I’ve seen thus far and what I’ve heard, is more about the cool characters than the actual plot, and the Consular storyline could easily have been saved by a selection of interesting characters. Unfortunately, this doesn’t really happen. You start with a Trandoshan melee tank, whose philosophy is about hunting and killing, and who is hanging around with you for some kind of unclear lore reason, whether you want him to or not. You also get a character whose defining characteristic is he’s a military guy, and another whose defining characteristic is that he’s a freedom fighter. Neither are terribly memorable. The Consular’s padawan (and potential love interest if you’re a male) is a naive teenaged girl who’s excited to see the galaxy (making the whole love interest thing really creepy), and who you don’t get until extremely late in the story, making her companion arc feel rushed. 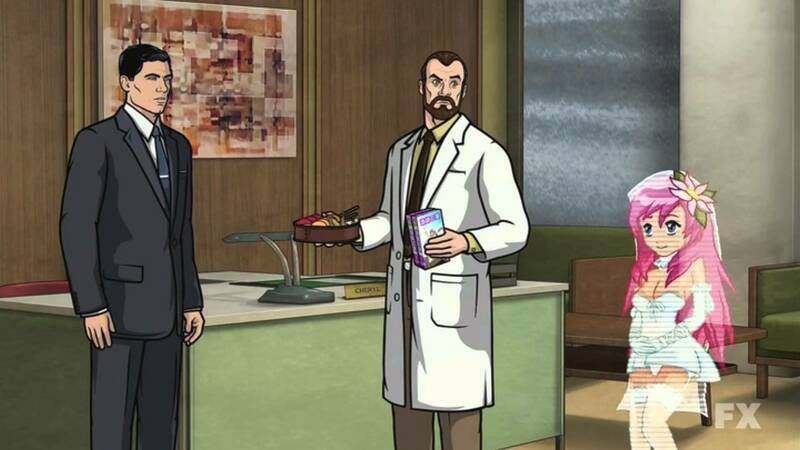 That having been said, the Consular does get one great companion in Tharan Cedrax, who is annoying and narcissistic at first but winds up being both extraordinarily useful and genuinely funny, and is a lot more complex of a character than most. What’s frustrating to me is that I’m trying to be as charitable as I can. For a story with so much potential, it’s riddled with problems and is punctuated by a few bright spots, but otherwise spends a ton of time telling you about Star Wars mysticism minutiae. It’s very similar to the Sith Inquisitor storyline in that respect, except that the mysticism you’re hearing about doesn’t have much bearing on what you’re actually doing, it’s just a loose justification. You get all kinds of lore about the mind-control virus that was invented by [ancient sith lord] and employed in [historical moment] and rediscovered on [planet you never visit], but in the end it’s just a reason for you to go save some people, and it leaves things feeling hollow. I don’t want to leave this without talking a bit about what I would have done to improve it, and why, but I’ve gone on for quite a while at this point. More tomorrow. To be fair on Nadia’s part, we do get to see her as a hang out NPC before she becomes a companion so she’s not entirely undeveloped. The Consular story should’ve focused more on the theme of Diplomacy and the issue of trust. The finale for Alderaan was good and the concept of holding together the Rift Alliance was fine, but not so much in practice. Would’ve introduced the Children sooner and by Act 3, there is an amount of paranoia as to whom can be trusted since these guys are in so deep undercover.